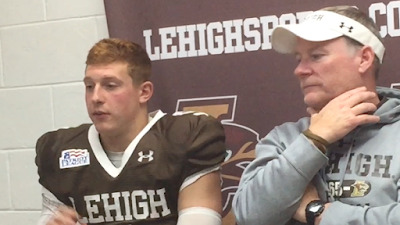 Lehigh 58 Fordham 37 Postgame Commentary: Coming Out Next Week "On Fire"
Lehigh football post-game press conferences don’t get much more relaxed than the one that happened last weekend. 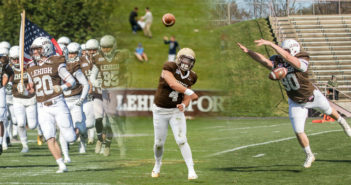 You can hardly blame head coach Andy Coen, senior QB Nick Shafnisky, junior DE Tyler Cavenas and sophomore RB Dominick Bragalone for feeling that way, after jumping to a 13-0 lead right out of the gates and piling up an incredible 57-9 lead against their opponents last weekend before calling off the dogs. It led to a familiar feeling in the post-game: talk of how the offense is clicking so well, how the defense keeps coming up big. There were plenty of accolades to go around. 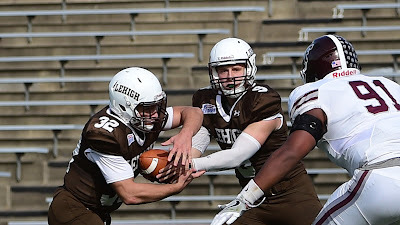 But when one media member tried to lightly broach the subject to Lafayette, the always-loquacious Shafnisky quickly steered the conversation back to next week’s game. That’s because Shafnisky, perhaps more than anybody, feels the importance of next week’s game vs. Bucknell.